Xiaomi CEO Lei Jun showed off a couple of devices yesterday, both of which are eagerly awaited products. We've already seen an official teaser of the 6.4-inch Xiaomi Mi Max phablet released on Xiaomi's English speaking website. Now, having the company's CEO show off the device during a live streaming broadcast (using the Mi Live app), is the icing on the cake. The Mi Max is rumored to feature that 6.4-inch display, with a 1440 x 2560 QHD resolution. The chipset under the hood has been rumored at times to be the Snapdragon 820 SoC, Xiaomi's in-house "Rift" SoC, and the Snapdragon 650 SoC. The latter was part of a GFXBench run through that showed the phablet coming with 2GB of RAM. Considering that the Mi Max is not expected to rank as Xiaomi's flagship phablet this year (that title goes to the Xiaomi Mi Note 2), the lower powered chipset seem more likely to be included. 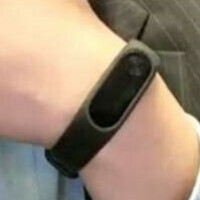 The other device shown off by Lei Jun was the Mi Band 2. The Mi Band 1 and Mi Band 1S were cheap fitness trackers that sold like the proverbial hotcakes. Since the bands came sans a screen, it relied on the use of an app and a smartphone to take the place of a display. But the Mi Band 2 looks like it will be sporting a screen. You still will have to pair it with an iOS or Android smartphone, and using an app will still be necessary to allow you to really look into the health related data that the device is compiling for you. So we would have to say that the Mi Band 2 and the Mi Max are both real devices. Things like the specs, price tag and launch date should be revealed pretty soon, we'd imagine. I get 45 days out of my Mii Band Pulse 1S. I have the sleep assistance feature turned on. This uses the optical heart rate sensor to help with the sleep analysis. I don't use the vibrating alarm clock or notifications feature, which would probably drain it more. I don't personally like the Mi5 but it has been a sales success for Xiaomi. I hope the Mi Band 2 still keeps the heart rate monitor that's in my 1S. If so, I think I'll give my 1S to my brother and scoop up the 2. If not I'll wait for the 2S. It's a great band for a cheap price. I wish it had a clock on it, but I wear a cheap digital casio watch, for timing my runs. Mii has been doing an amazing job at updating the app too. igeekphone has made the review, when will you make it?